Akebonoâs Performance Ultra-Premium ceramic brake pads offer braking power for drivers who have one thing in mind, performance. Made of the highest quality long-lasting material these ceramic brake pads are ideal for the spirited driver or fleet driver who pushes a vehicle to its limit. Whether for intense driving, loaded up work trucks, SUVs toeing a boat, or even law enforcement vehicles, Akebono Performance Brakes Pads can handle the job and outperform the competition. For the smoothest, cleanest, quietest braking experience install Akebono Performance Ultra-Premium brake pads. Akebono has developed specific ceramic brake formulations for each vehicle model, assuring the best fit, performance and the safest braking experience. For the smoothest, cleanest & quietest brakes, choose Akebono brakes. Akebono's Performance ceramic brake pads virtually eliminate brake squeal, brake dust, brake roughness and actually extend rotor and system component life. 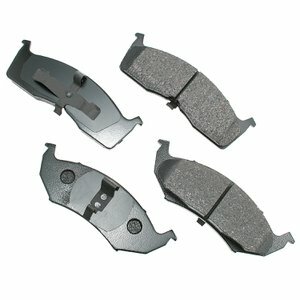 These performance brake pads are specifically designed for vehicles requiring excellent braking under the harshest conditions.